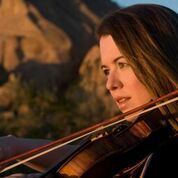 In 2009, American Record Guide said of her Vivaldi/Piazzolla disc with the Simon Bolivar Youth Orchestra of Venezuela: “I can imagine no suaver, more atmospheric performance.” HerMozartrecording won a Juno Award in 2011. She has been featured in People, US News and World Report,on CNN’s Showbiz Today, NPR’s All Things Considered, CBC, BBC, aBravo! Special: Live at the Rehearsal Halland on the cover of Strings.